NEW SAM Reference Rangel, T.F.L.V.B, Diniz-Filho, J.A.F and Bini, L.M. (2010) SAM: a comprehensive application for Spatial Analysis in Macroecology. Ecography, 33:46-50. 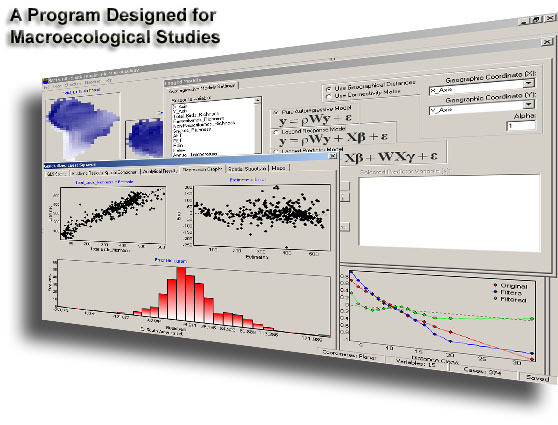 SAM (Spatial Analysis in Macroecology) is a program designed as a package of tools for spatial statistical analysis, mainly for applications in Surface Pattern Spatial Analysis. SAM is mostly used in the fields of Macroecology and Biogeography, but also in Conservation Biology, Community and Population Ecology, Geography, Geology, Demography, Econometrics, Psychology and Epidemiology. In short, if you are a scientist investigating patterns and processes that are geographically structured, SAM is what you were looking for! SAM is used worldwide by thousands of scientists, in more than 50 countries, as their primary tool for statistical analysis. In fact, a paper published in Global Ecology and Biogeography to announce SAM for the scientific community has a citation rate of ~50 new citations per year. It shows how much SAM is accepted and used as a valuable analytical tool in science. Download SAM today and join the thousands of SAM colleagues around the world! Yes, there may be no such thing as a free lunch, but there is FREE SAM! It runs beautifully under Microsoft Windows, and has a user-friendly, menu-driven, graphical interface. All these amazing tools are available to you at the click of your mouse! Just download SAM and you will soon note that SAM is extremely simple to install and very intuitive to use. A SAM update (v4.0) was released in June 2010, improving and fixing some issues present in v3.1. We thank the hundreds of SAM users that contributed to the development of SAM by sending suggestions and reporting bugs. The last SAM version (v3.1) was released in April 2009, with several improvements over earlier versions. You did not think it was possible, but SAM graphical interface is now even better! Shortcut buttons with cool icons put the most used statistical methods closer to you, anytime during analysis. If you are interested in any graph in SAM, just CTRL + Right click on it to copy either the graph figure or the graph data to the clipboard, which can then be pasted in any program. We are sure you will be thrilled by the new Model Selection and Multi-Model Inference module. Data exploration and model fitting was never so easy and intuitive. Just select potential explanatory variables and let SAM apply Akaike Information Criterion (AIC) to find the most parsimonious linear model. Easy as three clicks! Want to study the geographical distribution of a species based on presence/absence data? Make sure you check the new Logistic Regression Module, which makes binary linear modeling extremely easy and intuitive. If you have a reason to think that multiple spatially structured processes are driving your data, you should try the new Geographically Weighted Regression (GWR) module. Spatially explicit local regression was never so easy and fun! As usual in SAM all maps resulting from analysis will be under the reach of your mouse! Data management in SAM is really easy! SAM is compatible with text files (.TXT), DBASE tables (.DBF), Excel spreadsheets (.XLS) and ESRI Shapefiles (.SHP). With that much compatibility, SAM will certainly be able to easily open your dataset. SAM is CPU friendly! That means that if you have a multi-core computer, SAM will take advantage of the computational power and perform multiple calculations simultaneously. You will notice that SAM is a very powerful yet light software! Forget about those expensive, command-line statistical packages that are full of keyboard commands that you have to remember every time you need to analyze a new dataset. Now you will no longer need to ask your colleagues about that particular command you always forget (it happens to everybody). Just click your mouse and you will quickly have all results you need, analytical or graphical, in a concise form, right on your screen. SAM is fully integrated to the GIS world, and allows users to import data from and export data to ESRI ShapeFiles. You can use the GIS map module for a detailed investigation of results of statistical analyses, or you can save your data in a shapefile to open in another GIS platform. Say goodbye to the waste of time on data transfering between softwares: SAM reads and writes about all file formats! 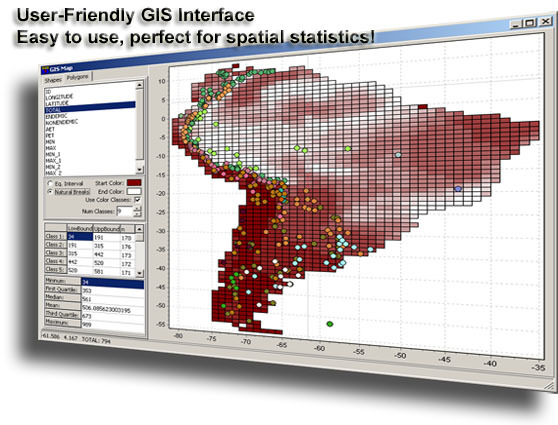 SAM has the most user-friendly and intuitive GIS interface among statistical packages. With just a couple of clicks you can produce fine-art GIS maps, easily customizable... ready to publish! You can map polygons, points or grids. You can categorize the variation using color classes easily. The program has a graphical interface especially designed for an intuitive exploratory data analysis. Each module has a full set of analytical and graphical results that are automatically displayed when you ask SAM to compute some statistics, allowing an interplay between model computation and evaluation. But it is not all! For your convenience, SAM does not require those nagging stops to re-evaluate spatial autocorrelation in the residuals every time you compute a new model, it just analyzes the residual spatial structure instantaneously! 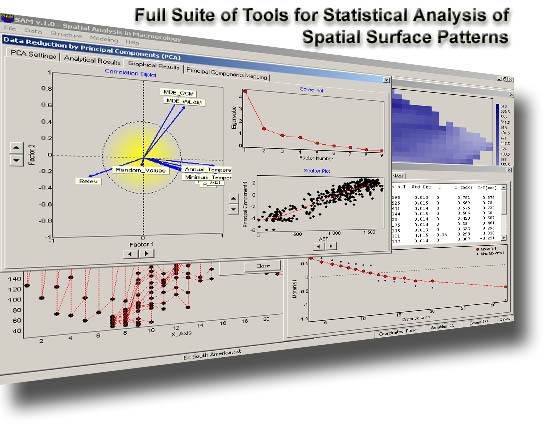 Several graphical options, including 2D or 3D scatter plots. Tools to explore the values of the data straight from the graphs. Instantaneously adjust polynomial to your scattersplots up to sixth order. Easy and fast smoothing tool for 3D scatter plots. Besides cool graphs, with graphical options always handy, you can just CTRL+right click in any graph to copy either the graph figure or the graph data to the clipboard, making it available to be pasted in any program of your interest (e.g. MS Word, MS Exel). Take advantage of the GIS mapping module in SAM. 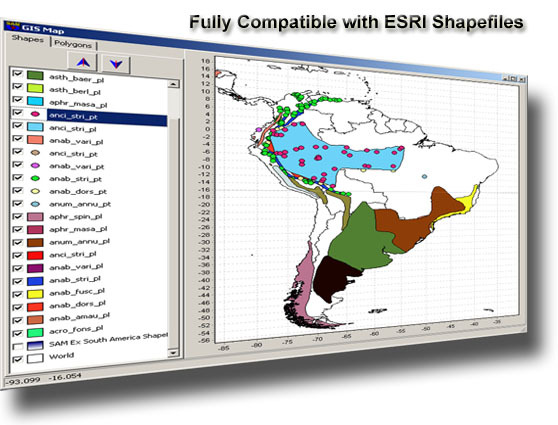 It is the most user-friendly graphical interface for Geographic Information System ever designed in a spatial statistics software. SAM has now full compatibity with ESRI ShapeFile, by opening and saving data into this file format, and facilitating the interface with GIS softwares. Mapping your data to visually explore the spatial structure. Mosaic or interpolated surfaces are available. Also, contour lines may be fitted to enhance the spatial pattern. Use the new �pattern finder� tool to select regions in the scatterplot and automatically highlight them in the map and in the spreadsheet. Of course, reverse direction is just as easy! Easily create networks of connection among your sampling locations arbitrarily or according to several network criteria, like Delaunay Triangulation, Gabriel, Relative Neighbourhood, Minimum Spannin Tree, Distance Interval. Networks the become available for a wide range of spatial analyses in SAM. If your variables violate the assumptions of the analysis of interest, you can try any of the several handy mathematical transformations available in SAM. Reduce the dimensions of your data easily, synthesizing information into a few variables, avoiding collinearity and redundancy, using Principal Component Analysis (PCA). Analyze the spatial structure in your data by means of autocorrelation coefficients, such as Moran's I and semi-variance. SAM offers a very flexible tool that allows you to compute autocorrelation coefficient according to spatial distances (planar or geodesic) or network connectivity. Significance may also be tested by randomization procedures. And if you are looking for Semi-Variance, this module is for your! You may compute and easily parameterize it according to eight different models. However, if you are looking for fine spatial autocorrelation structure in your data, you may use and save the Local Indicator of Spatial Autocorrelation (LISA), based on Local Moran's I, which can be tested with randomization procedures. Filter broad-scale or small-scale spatial trends in your data using Trend Surface Analysis (TSA) or an Principal Coordinates of Neighbor Matrices spatial filter (PCNM, also known as "eigenvector-based" spatial filter). Search for spatial outliers, scattering the values of a variable against the expected values according to spatial position. Find the groups of observations that are similar by performing a cluster analysis with k-means procedure. Also, in SAM k-means can be spatially constrained, in order to find patches of similar observations contiguous in space. Compute ordinary correlations among variables, and correct their significances estimating the correct number of degrees of freedom according to the magnitude of spatial autocorrelation. 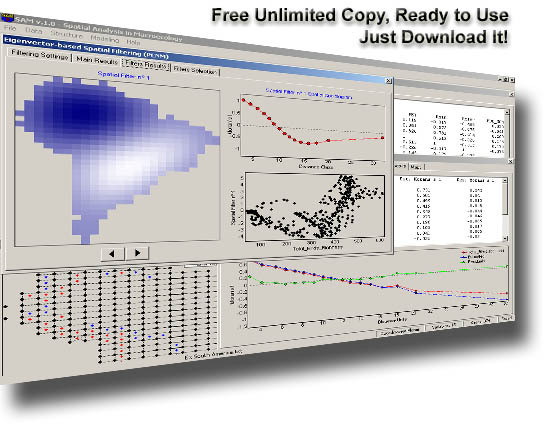 Model a variable using SAM's highly intuitive graphical interface to perform Linear Regression Analysis. Check your model results, including the residual spatial autocorrelation and feel free to easily re-compute your model instantaneously. If you prefer, use Partial Regression to partition between the magnitudes of explanation due to your explanatory variables or to the spatial trend itself. It is easy to try several autoregressive models available in SAM. Estimate the autoregressive parameter and the magnitude of spatial autocorrelation by Pure Autoregressive Model available in the Lagged Models. Alternatively, filter response and predictor(s) variables, making sure that the results of your model are not influenced by spatial trends. Try a straightforward, didactic and interactive two-steps Spatial Generalized Least Squares (spatial GLS, or kriging-regression). Model your data using well-known autoregressive models: Simultaneous Autoregressive Model (SAR), Conditional Autoregressive Model (CAR) or Moving-Average Model (MA). In recent months, input from around the world resulted in several refinements to SAM. If you are a SAM user, and would like to contribute to the improvement of this program, please send an e-mail to rangel.sam at gmail dot com. Interested in statistical and computational methods applied to macroecology and evolutionary biology. Current projects involve the development and implementation of spatial simulation models to understand the role of historical (evolutionary) and contemporaneous (ecological) factors driving broad scale geographical patterns in biodiversity. He is currently member of the editorial board of the journal Ecography. Professor of Animal Ecology and Evolution at the Department of Biology, Federal University of Goi�s, Brazil. He is a 1A research fellow of the Brazilian Council for Scientific Development and Technology (CNPq). His main research interests concern the evolutionary aspects of macroecological theory and the application of spatial statistical methods in macroecology, evolutionary biology, population biology and conservation. Current projects involve the application of spatial autocorrelation analysis and phylogenetic comparative methods to understand ecological processes associated with latitudinal gradients in species richness. He is currently editor of the journal Global Ecology and Biogeography. Professor of Animal Ecology and Evolution at the Department of Biology, Federal University of Goi�s, Brazil. Interested in statistical methods applied to biodiversity analyses and limnology. Current projects involve the analysis of spatial population synchrony of aquatic assemblages in reservoirs and floodplains. He is also interested in how population dynamics are linked with more general biodiversity patterns, mainly the relationship between species diversity and ecosystem stability. He is currently member of the editorial board of the journal Hydrobiologia.